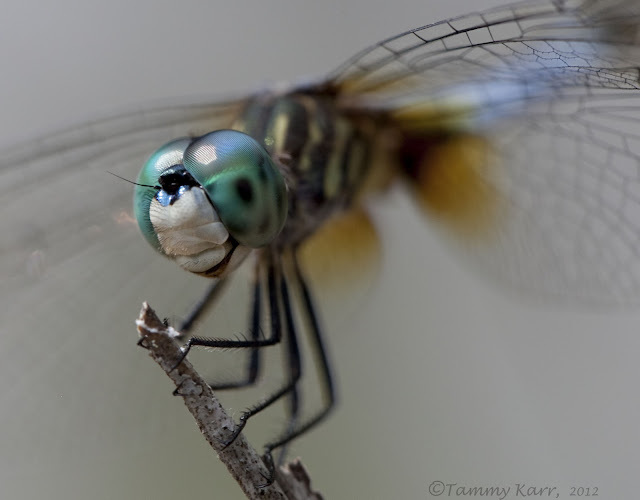 Ever wonder what makes a dragonfly fly smile? Well, I really hadn't either until taking some photos of this delighted dasher. These fine friends are welcome in my yard as they help control those pesky, unwanted mosquito. The dragonflies are rivaled in numbers only by the lizards. 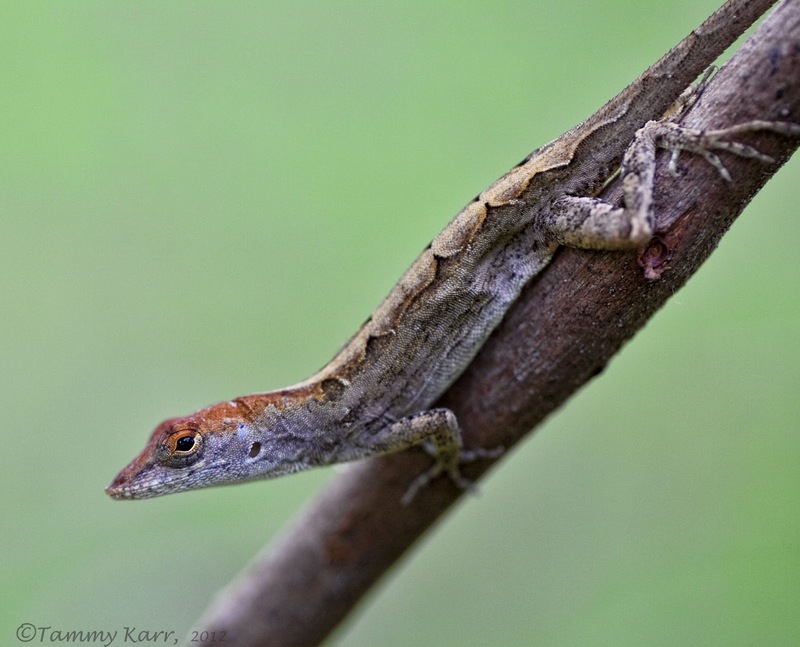 Brown Anoles, which are an invasive species, are an extremely populous species of lizard found in this area. This fellow was enjoying some type of long legged insect. These are great! The dragon fly photos are amazing!! Great color and detail. fantastic images again Tammy, great to see. EXcellent macros of the dragonfly!! Beautiful photos! Love the close up detail! 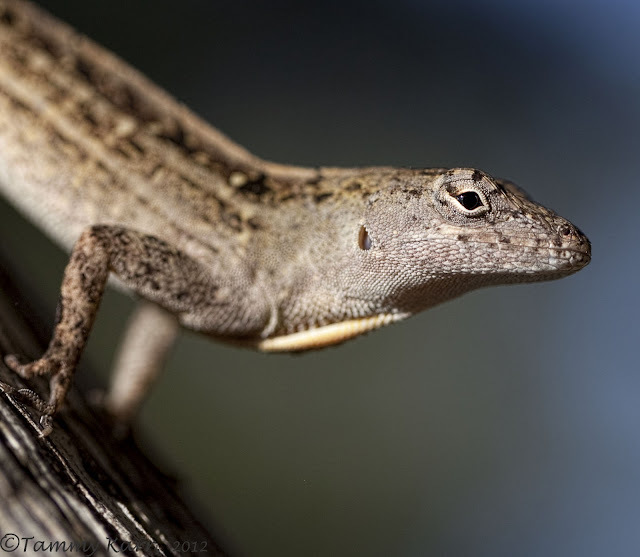 The lizards are cool (other than being an invasive species). We don't have anything like that...too cold here, I guess. Great stuff Tammy, nice to see what else you have out there. GUAUUUUU!!! que maravilla de macros. Excellent macro and portraits Tammy, congratulations.! Wow, Tammy! You should know I am so captivated by dragonflies that I wrote a children's fantasy story about them :) These shots are excellent, catching the thousands of lenses on the dragonfly's eyes. How did either of these jittery creatures allow you to get so close to them for these shots? Does your macro lens allow you to be further back? Hi Rosemary, I saw that on your blog! I am always captivated by your eloquently written blog posts; I bet your book is a great read. 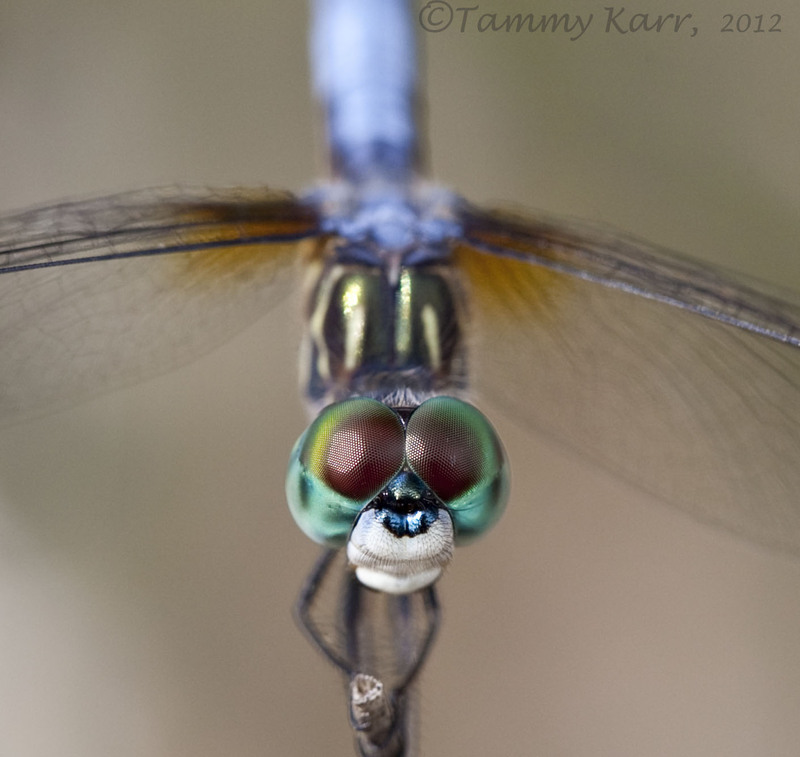 There are so many dragonflies in my back yard right now and this one didn't seem to mind some company. I slowly moved closer and closer to it and it stayed still for the most part. I was using a 100 mm marco lens, so I actually was quite close to it. LOVE those faces! :) Fantastic! The lizards are moving into our area now - the first season I have seen them here. I am glad to have any critters around that eat bugs. you rocked these photos, as usual! wow! Ufff Tammy, te superas con cada entrada amiga mia. Esta es genial. Besos desde Extremadura. 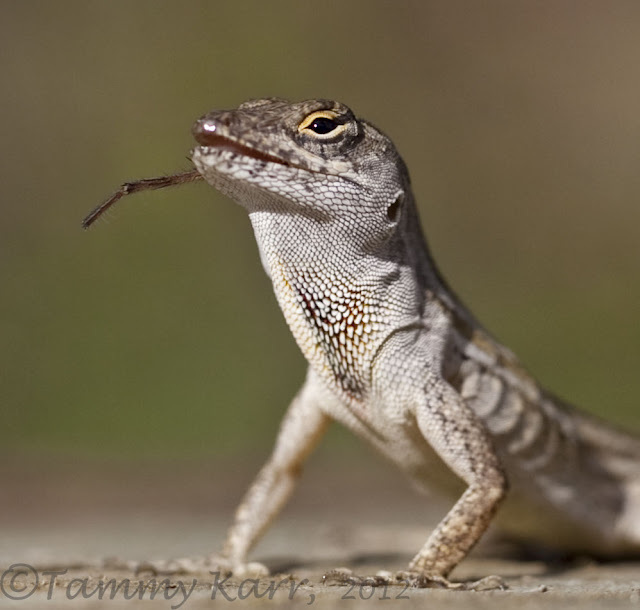 thank you for visiting my blog while I was away, I really appreciate it, the lizard is so cute...enjoyed this post Tammy, great macro detail. Right into my other passion... dragonflies! This one doesn't look like the French darters I usually encounter! The quality of your macros is superb! Congrats and enjoy your day! Here you have got some fantastic great pictures of Dragonfly and lizard. Enjoyed all the pictures well. Bonitos primeros palnos, buenos acercamientos. I like the pose in #2, and that you can see the pattern in his eyes. I hardly ever see that in dragonfly shots. Your photos are always so crisp and detailed! What a great shots!! Fantastic to see the dragonfly so close. Funny with the big eyes. 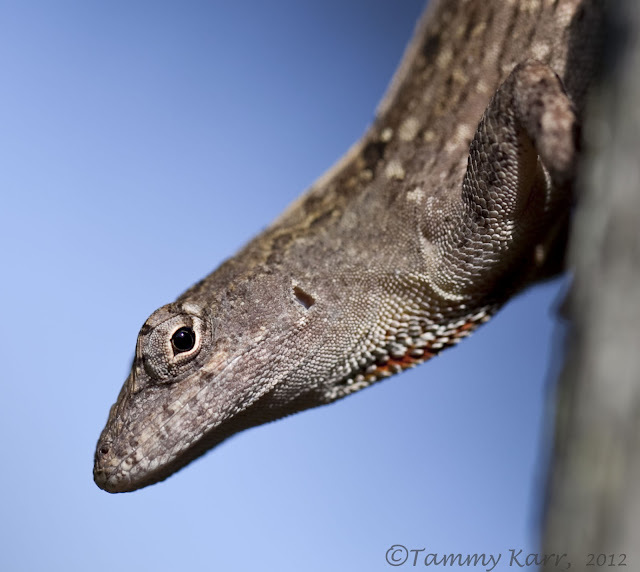 The pictures of the Anole are wonderful too. Great pose and good sharpness. This is real enjoyment, thanks for sharing it Tammy. Tammy, your outstanding photographs put a big smile on my face. Spectacular macros ... each and every one of them. The detail and colors in your captures are terrific. The second image of the dragonfly knocked my socks off. Unbelievable sharpness. Super fine work, as always! 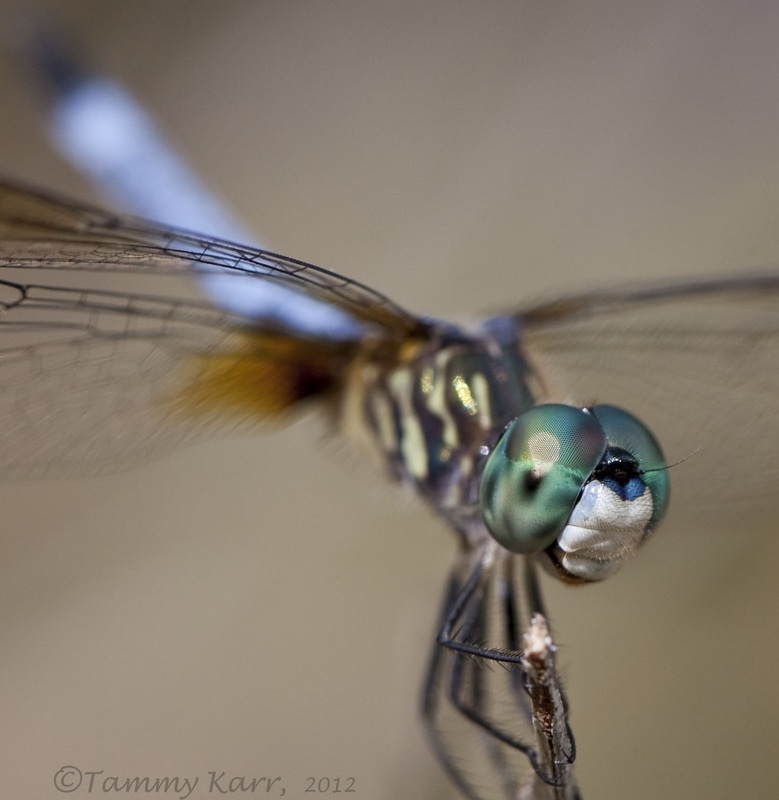 Wow Tammy - thes macro dragonfly photos are unbelievably stunning!!!! Love the Dragonfly photo's, they are just amazing. What a wonderful photographer you are. Bit of a all rounder I would say. Yours are beautiful, evocative images, Tammy. Seeing dragonflies and lizards in extreme close-ups somehow gives them personalities that aren't apparent when I look at them from a little farther away. Here in Connecticut, I live near wetlands, where dragonflies thrive. I'm told that their presence means the water is healthy. So these beautiful creatures bring good news environmentally – and artistically. Awesome shots! I love these macro pictures. Good Work! Que primeros planos, que maravilla, si señor, felicidades por tan estupendas fotos, buen trabajo. Brilliant shots of the dragon flies Tammy, sharp at the perfect point ! What a wonderful variety of wildlife you have in your yard, Tammy. Lovely macro photography! Love the smile and the scales. Terrific photos Tammy. Hola Tammy estupendas fotografias de esta variedad de lagartos.Un fuerte abrazo. Absolutely stunning macro photos. The blue darter are amazing. Superb the dragonflies, and the lizard, you are a wizard. Love the ones of the dragonflies. Wish you a wonderful week, Tammy. Klasse Bilder von der Libelle. How beautiful, I have no words!!!! the eyes of the dragonfly are ipnotic :-) and the lizard is posing for you, I'm sure that animals feel your love for them, so as you can transmit it with your photography. really wonderful work! !